Spring is upon us and Minnesotan’s know what that means.. Q2 Minneapolis VMUG time! Stick around to win great door prizes! Meeting Location, Snacks, and door prizes provided by Hewlett Packard, Inc., N’compass, Inc., and VMware, Inc.
Hilton Hotel 494 & France Ave.
Have you seen the new VMware User Group website? As a VMUG member or a VMware enthusiast, you need to made aware of a limited time offer which is tied to a new exclusive offer available to VMUG members only. I’m going to introduce the program in more detail at the May 20th Minneapolis VMUG but you need to know about this offer now because there is an opportunity to purchase the package at a discount between now and May 21, 2011. VMUG Advantage (click the link & view the major benefits) is a new, exclusive offering for all VMUG members around the world. VMUG Advantage provides you an opportunity to enhance your VMware experience and knowledge through specific offers for training, VMworld and product licenses for VMware Workstation and VMware Fusion. Be the first to experience these great offers with VMUG Advantage promotional pricing. Purchase in the first 60 days (now through May 21), and save even more! In a time where the term “return on investment” is more important than ever, VMUG Advantage delivers. Save upwards of USD $1,700 while increasing your knowledge and network. VMUG Advantage isn’t for everyone. Click the earlier VMUG Advantage link and view the benefits. 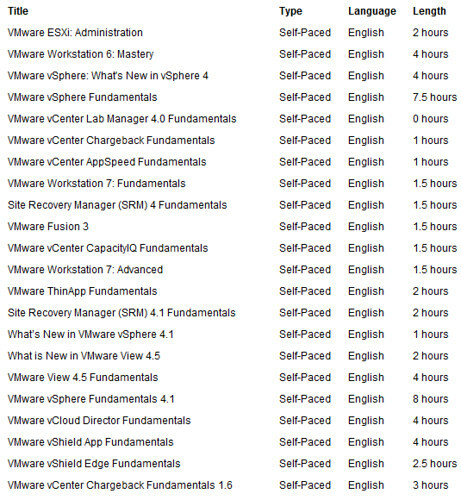 Depending on your VMware spend for 2011, the discounts you achieve may more than pay for the cost of the VMUG Advantage subscription. However, if you aren’t planning on a VMworld trip or if you don’t need the eLearning, VMUG Advantage may not be a worthwhile membership for you. At any rate, you owe it to yourself and your budget to check it out. There may be something in there for you. I’d like to invite any and all members of the VMware User Group to join us on Friday for a breakfast presentation and a movie at the new Showplace Icon movie theater in St Louis Park. St Croix engineer, Bill Oyler, will recap his top 5 take-aways from VMworld and take some follow-up Q&A along with Jim Yanik from VMware. We’ll follow up the presentation with a complimentary premier screening of “The Social Network” movie. Concessions will be provided. Friendly reminder that from 1-5pm this Friday, the Minneapolis VMware User Group will hold a quarterly meeting in Bloomington. I expect a lot of VDI content. The meeting details can be found here. VMware is proud to work with the Minnesota Assistance Council For Veterans (MACV) by supporting a one day SOCK DRIVE BLITZ at the VMware User Group Meeting (VMUG). On Friday 21 May 2010 MACV and VMware will be collecting packages of new white cotton socks (primarily men’s sizes) as part of the MACV Veterans Standdown. The socks collected will then be distributed to homeless veterans in need at the Various standdown events across Minnesota throughtout the year. Minnesota Assistance Council for Veterans (MACV) is a 501(c) 3 non-profit organization assisting veterans (and their families) in crisis throughout Minnesota for over 18 years including those who are experiencing homelessness. MACV is the only organization of its kind in the State of Minnesota completely dedicated to serving the needs of veterans, and is nationally recognized for its model and success. Once in a while, I’m a witness to acts of extraordinary kindness from a person or group of persons. It may not occur on a regular basis, but when it does, it is something special to behold. It happened this afternoon at the Minneapolis Area VMware Users Group (VMUG) meeting. It started out as a fairly typical event. I called the meeting to order, briefly went through some general business and current events in the VMware virtualization community, and then turned the meeting over to our first speakers Craig Drugge and Pavan Jhamnani of Syncsort. I took a seat, prepared to learn about Syncsort’s data protection and rapid recovery technologies. However that was not to be, at least not right away. Instead, Pavan invited Michael Cardinal of ThinLaunch up on stage. I was curious about what was transpiring since this was Syncsort’s hour and I wasn’t aware that ThinLaunch had any ties to Syncsort’s technology. Michael took the stage with a white paper bag in hand and began speaking to the audience about a person he has known for a few years. A person who diggs virtualization. A person whom he’d bumped into at VMware Partner Exchange early Wednesday morning at Starbucks Mandalay Bay. I caught on pretty quickly that he was referring to me. Michael proceeded to announce my recent VCDX certification accomplishment. I thought that was extremely generous of him, but there was more. Michael asked me to come up on stage where he presented me with a gift. This was something that he, his wife, and Bill Hinkens (Territory Manager, VMware) collaborated on. 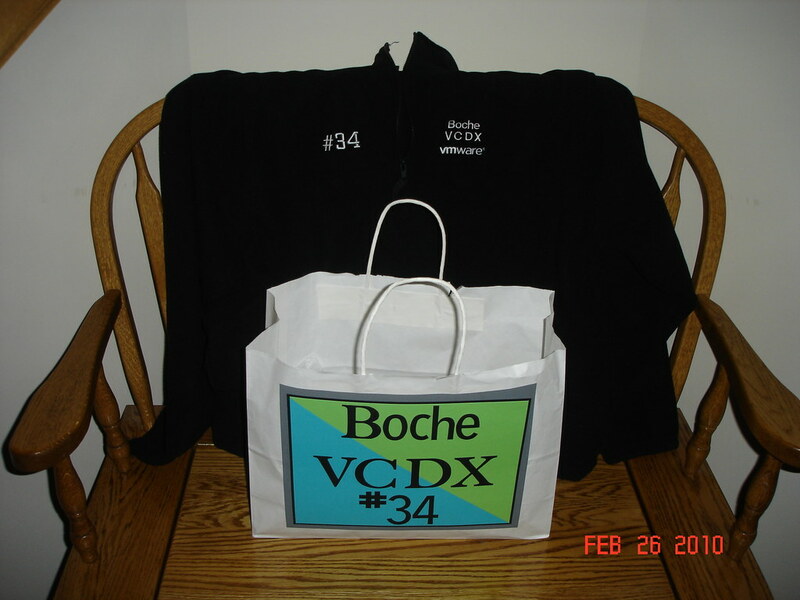 Michael turned the bag around to reveal the VMware diamond plate artwork along with my name and VCDX #34 on it. Inside the bag was a black VMware fleece sweater, again with my name, VCDX, and #34 on it. I was at a loss for words. I accpeted the gift, thanked Michael, and we took our seats. The meeting continued from its brief diversion. The sweater, the bag, the presentation, the planning, the thought, these were all wonderful gifts from a group of people who went out of their way which I will remember for a long time. Virtualization, for me, has built a great community of people and in many cases has yielded friendships at a professional as well as a personal level. 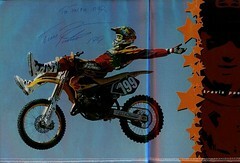 For that I am very thankful and each day I look forard to what the future brings. Lafe Low wrote a nice article for Redmond magazine about the history, fundamentals, and benefits of IT user groups. You may not be aware of this but there are many active VMware User Groups (VMUGs) around the world that you can get involved in. The largest VMUG event I’ve heard of is in the Netherlands where they had 600 or more attendees at their event just recently. The Dutch are coo-coo for VMware virtualization and it shows by their VCP numbers I’m told. I lead the Minneapolis area VMUG and we meet quarterly, as do many of the other VMUGs. We had one of our largest meetings last December with 150+ people. Our numbers have been steadily growing. Read Lafe’s entire user group article here. There are still many individuals and companies that do not have the understanding or adaptation of virtualization. Meeting after meeting, I see new faces attend, unsure of what this virtualization stuff is, and after the meeting they walk away with a much better understanding, and even better, the confidence they needed to reach out to others and ultimately begin their virtualization adventure. Jean Williams heads the user group division at VMware and does a great job with the help of Kristyn Ha. I would like to point out, however, that VMUGs are run by the users, for the users. This isn’t corporate propaganda jammed down our throats with a potato masher. These are peer level meetings with a wide range of expertise, knowledge, and experience. It’s straight talk about VMware virtualization benefits, strategies and related 3rd party products, and we don’t sugar coat, overlook, or ignore VMware issues. Become a VMware User Group member today! No VMUG in your area? Start one!